Melbourne weather can be quite erratic and difficult to adapt to at times. While heat waves are predictable during summer there are other times of the year when it would be nice to have a reliable, cost-effective and eco-friendly cooling solution to cope with the Australian climate. How do you currently regulate temperature in your workplace or home environment? Did you know that evaporative cooling is one of healthiest ways to keep homes and other dwellings cool? 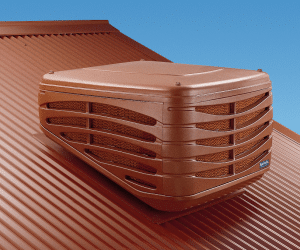 Rather than recycle and recirculate air that could be contaminated with allergens and odours, an evaporative cooling system draws air from outside via a unit on top of the roof. This air is filtered by moistened pads and is then dispersed throughout your existing ductwork to direct airflow to all your zoned rooms or areas. Are you looking for more than just an air conditioning installer? At Advance Heating and Cooling we understand that you will need ongoing support to maintain your climate control investments. We offer other services such as ductwork inspections, filter cleans and general maintenance check-ups to ensure that your equipment is always running at peak efficiency. If you need specific parts like AC fittings or a replacement return air grille we can also assist you. For more information about evaporative cooling solutions in Melbourne call us today and request a quote.